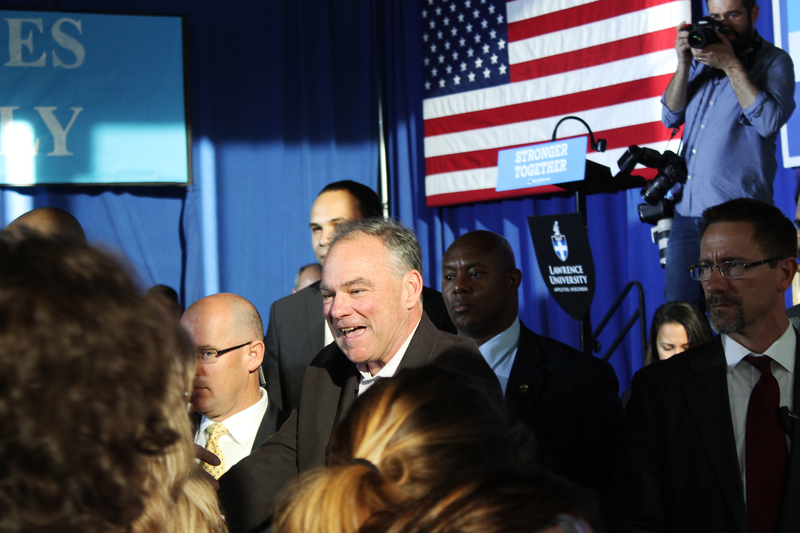 Senator Tim Kaine greets the crowd after his remarks. On Tuesday, Nov. 1 at 2 p.m., as Beta Theta Pi shoveled 14 tons of sand into their house in the wake of their annual Beach Bash, hundreds of students and citizens of the Fox Valley gathered in the Somerset Room of Warch Campus Center to hear speeches by Democratic nominees Russ Feingold and Senator Tim Kaine. As the Nov. 5 early voting deadline rapidly approaches, Kaine and Feingold are traveling across Wisconsin to promote early voting. Feingold explains the importance of early voting by saying simply, “We can stop thinking about you.” Feingold also catered to the large proportion of Lawrence students in the room and enthusiastically discussed his connections to Lawrence. He holds an honorary degree, has close connections to alumni and has guest-taught classes for a foreign policy course. Kaine emphasized the power of early voting to signify how well the campaign is doing. The two also emphasized the importance of freeing volunteers to reach out to undecided voters. Getting new volunteers on board in the final stretch of the campaign was also a goal of the event. Much of Kaine’s speech was in support of his running mate. “I’m am so proud to be a strong man supporting the first strong woman to be nominated by a major party to be president of this country.” He said, “Hillary doesn’t like to brag about herself, but I’ll brag about her.” He praised Clinton’s credentials and support of children and family throughout her career despite various hardships along the way. Elizabeth Bridgewater, a freshman, also voted early via a Colorado absentee ballot. She felt that it was important to her to vote in her home state, but also feels voting early will allow her to volunteer more in the last week of campaigning. “It was interesting to hear Senator Kaine talk and get to know him as a person and compare his public speaking to Hillary Clinton’s,” she said.